Although we still have a few weeks of summer remaining, the change to fall is in the air. It’s a great opportunity to enjoy one of the best and most enjoyable times to grow your own food. Started my first planting for fall lettuce about mid August. Transplanted the seedlings to the garden day before yesterday. No rain. Soil was bone dry so carried in some buckets of rainwater to water them in thoroughly. I seeded containers with 5 more varieties yesterday and will continue to plant at least every other week through October. If you want lettuce all through the fall, winter and into early spring just one planting of lettuce won’t do it. Succession planting is the key: plant some lettuce; in a week or two plant more; repeat. It’s hard to beat my favorite varieties of lettuce: Winter Density (a romaine) and Sierra Batavia (a crisphead). Both delicious! And considered (by me) to be the best of the best in taste, performance and beauty. Thanks to a friend, I’ve now discovered a variety that I like just as much as my favorite two. As a matter of fact, I’d go so far as to say that if this “new discovery” were in my garden along side the other two varieties, I’d be eating more of it than the others. After looking at what various suppliers had to say about this new one, I understood why I liked it so much. It’s a combination of a batavian crisphead and a romaine! It’s tolerant of hot weather. My friend brought me a crisp, beautiful head in the hottest part of July this year. Sweet as could be without a hint of bitterness! I have high hopes of a great fall performance. And if it does well under my protective covers through the winter I’ll be overjoyed! The variety is Concept. Why not give it a try. Serving it at your big Thanksgiving (and/or Christmas) dinner should bring all kinds of rave reviews. Garlic – Tip for stress-free planting in October or November. As fall and holidays approach, everyone seems to get busier. 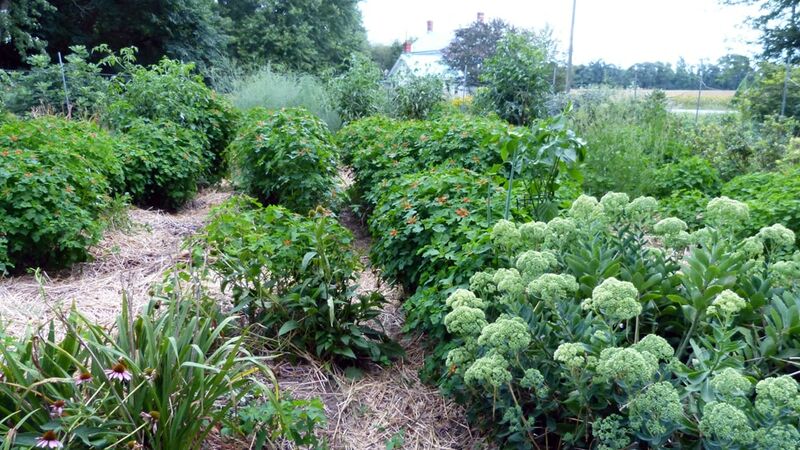 Select the beds that you’ll plant with garlic and prepare them now. When the time comes to plant, all you’ll have to do is separate the cloves, plant, and mulch. Mid October is a good time to plant in areas further North. Planting garlic that early here in Virginia gives me too much above ground growth before the cold sets in. I wait until November to plant. That gives my garlic plenty of time to establish strong roots underground, but not make too much growth above ground. Most seed garlic ships in October, in time for planting in almost all areas. I’ve noticed the most popular varieties sell out rather quickly. If you haven’t ordered, it’s a good time to check it off your list. Now’s a great time to choose where your tomatoes are going next year if you plan on transplanting your seedlings into the stubble of winter rye. With the help of still standing tomatoes and my garden chart I’ll look for spots that have not had tomatoes for at least 2 years; preferably 3. In late October or November I’ll sow winter rye seed into those spots. Most of my beds are about 3’ wide by 16 feet long. Spots chosen for tomatoes will vary in size. I’ll sow the winter rye only where the tomatoes will go. Makes it easy in the spring. I look at the rye and know exactly where my tomatoes are going to reside. This strategy works great for almost any warm weather crop like cukes, squash, melons, peppers, eggplant, etc. Even if you’re a beginning gardener, fall can be one of the best times to garden. Grab the opportunity if you can. 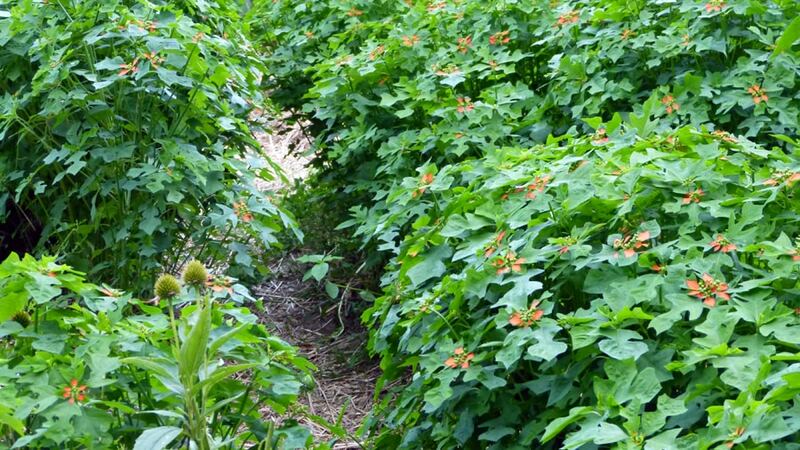 Couldn’t resist adding two pictures of my entrance path bordered by the annual, summer poinsettia, that I use as a cover crop in some of my beds each year. It’s above my elbow in height and beautiful. All kinds of bees and insects swarming on it everyday. They love it as much as I do. Entrance path bordered by summer poinsettia at the end of August. Taken from the entrance gate to show summer poinsettia and some of garden. Growing Garlic – Yours Large Enough for You? Still Eating Lettuces from Your Garden In January/or Not? All content including pictures is copyright by TendingMyGarden.com. All Rights Reserved. That is a wonderful strategy for knowing where to plant your tomatoes next year. Is your garden chart a drawing of your garden? If your garlic had a chance to grow a lot of green before the real cold set in would it make your garlic bulbs smaller? You’ll reap great rewards from succession planting, Toni. No drawing per se. I just use the ruled line on that paper and number the bed. Nothing fancy. I planted garlic in mid October for years and still got great results and nice bulbs. the idea that top growth is at a minimum going into winter. Again — I’m not sure it makes any difference. When growth was up about 6 inches going into winter the tips turn brown, but that doesn’t seem to hurt. If you’re planting earlier than I do, don’t worry over it. You sure don’t need something else to concern yourself with. Glad you enjoy the pictures. I just couldn’t resist including them. LOVE the pictures! And not a weed in sight! I think this has been the busiest summer of my life! Having to spend more time away from home than ever before. Working 2 jobs & needing sleep! I really needed these pictures. Thank you so much for sharing. My garden update: Still harvesting the kale from the seed you shared. Black Swallowtail caterpillars are allowed to share my parsley. The high temps took away all of my thyme plants. Swiss chard is the winner for my vitamin shakes. Getting ready to start more lettuce & other various greens. I had a small, but wonderful, mixed-color carrot harvest. Loved my different colored first potato harvest! Had PINK mashed potatoes! I need to start dinner before leaving for my afternoon job. Thank God for friends like you whose posts keep me grounded in the garden which provides my health! P.S. Figs are coming in! Yea! I’m praying for enough to make a small supply of fig jam.